All in, I had an absolute blast with this book and if you haven’t tried Neal’s work before this would be a good place to start as it has a fairly familiar feel to the reader. Add to this the additional skills picked up from previous titles and his work really does get better and better. Great fun all in and a title that I really think should get some decent recognition. There’s certainly no lull in the action as Asher paints Saul’s trail of destruction and the nightmare world he seeks to bring down. I want to know what happens next. I don’t think The Departure is for everyone but it is a good standard fare science fiction with a bit of social critique and a lot of action. ...delivers plenty of thrills, and the climax also sets up a very intriguing status quo for the second volume. The Departure makes Orwell’s 1984 look like a utopia in comparison. The future Neal imagines is far more disturbing due to the Committee’s absolute disregard for human life. They possess both the technology for constant surveillance as well as the weaponry to extinguish human lives by the millions, something the government in 1984 never had. The politics is very interesting. 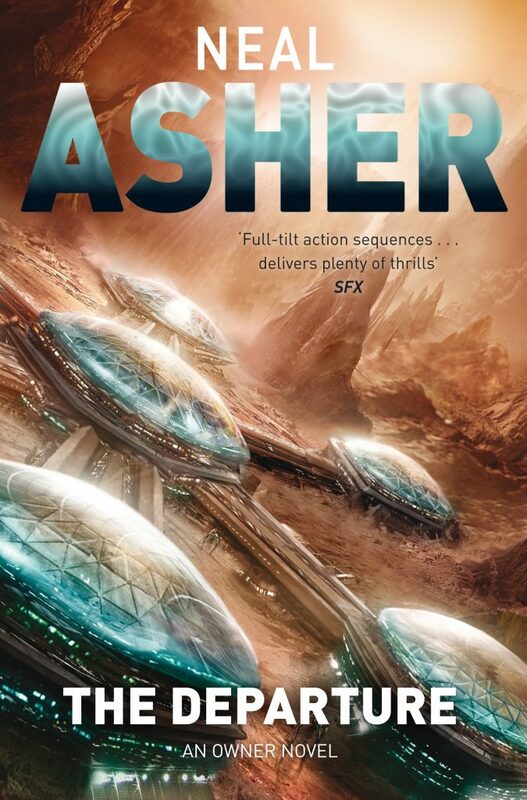 Asher seems to have perceived a slippery slope and extrapolated in the extreme. Something like the EU has, thanks to a complacent populace, taken over the whole planet. This is the Committee and it has long since stopped pretending to be democratic and gone outwardly Orwellian. Cigarettes are illegal; armed robots are used to control rioting crowds; selfish, individualistic dissidents are taken away for readjustment by pain inducer; and clever scientists are allowed to do research useful to the state but are considered a risk and kept under scrutiny or even lock and key. The protagonist is one such scientist who sets out to get revenge. This is a very different book to those in the Polity series, dark and gritty with the high levels of violence and waste that occurs when power corrupts humans and they battle each other to enforce their point of view. I was busy reading about giant space battles, spider gun robots and 23rd century warfare and revolution. It was a fun wild ride and only after it was done did I realize that Asher and I see a lot of the same problems coming in the future we just don't agree on the root cause. In the end I enjoyed The Departure and I am interested enough in the story that I am going to read the second book when it comes out.